Engineering begins with a design problem: how to make occupants of vehicles safer, settle on an inter-face for an x-ray machine or create more legible road signs. In choosing any particular solution, engineers must make value choices. By focusing on the solving of these problems, Ethics Within Engineering shows how ethics is at the intellectual core of engineering. Built around a number of engaging case studies, Wade Robison presents real examples of engineering problems that everyone, engineer or not, will recognize, ranging from such simple artifacts as toasters and the layout of burners and knobs on a stove top to the software responsible for the Columbia airliner crash. The most dramatic examples center on error-provocative designs: designs that provoke mistakes for even the most intelligent, well-informed, and highly motivated. These examples all raise ethical issues, posing questions for the reader, forcing the give-and-take of discussion in classrooms and the consideration of alternative solutions that solve the original design problem without the unfortunate features of the original solution. 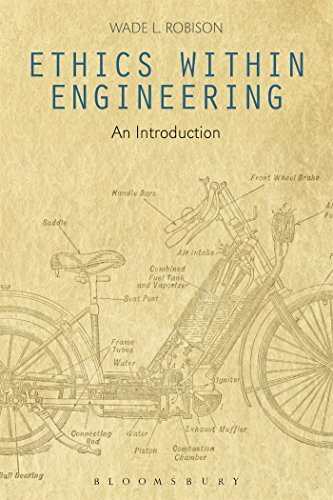 This original, focused approach provides an ideal entry point for anyone looking to better understand professional ethical responsibilities within engineering. About: Engineering begins with a design problem: how to make occupants of vehicles safer, settle on an inter-face for an x-ray machine or create more legible road signs.